Biogas production from waste is taking off in South Korea with the help of two Swedish companies at the forefront of the biogas industry. 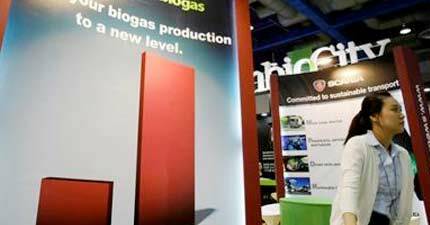 Biogas production from waste is taking off in South Korea with the help of two Swedish companies at the forefront of the biogas industry. We follow biogas news from Sweden quite closely as that country is speeding ahead in the production and use of biogas for both heating and as a transportation fuel. A good deal of taxis and also some busses already run on biogas in Sweden and several public transport companies are planning to convert their diesel powered fleets to run on liquid biogas. See a good story on the plans of Swedish public transportation authorities and bus companies right here. The gas to be produced from food waste in South Korea will not be clean enough to use as a vehicle fuel. Instead it will be sold to an industrial user for internal heating. You can read more about the biogas plans in South Korea here. One of the Swedish companies operating in South Korea is Scandinavian Biogas. A related company, Scandinavian GTS, will be presenting at Driving Sustainability ‘09. Its CEO, Mr. Hans Kattström, will give a talk on liquid biogas as a vehicle fuel and how it will greatly increase the potential of biogas as fuel for trucks and busses. Some even say that biogas and liquid biogas will become the main fuel in Sweden in ten year’s time. This August we´ll see a ten year anniversary of the only Icelandic biogas company Metan that produces vehicle fuel from a waste landfill. There’s already a couple of busses, all the garbage trucks in Reykjavík and a little over 100 smaller cars running on this domestic fuel in Iceland today. A fuel that decreases the share of imported fossil fuels, and is both greener and considerable less expensive than oil and gasoline.